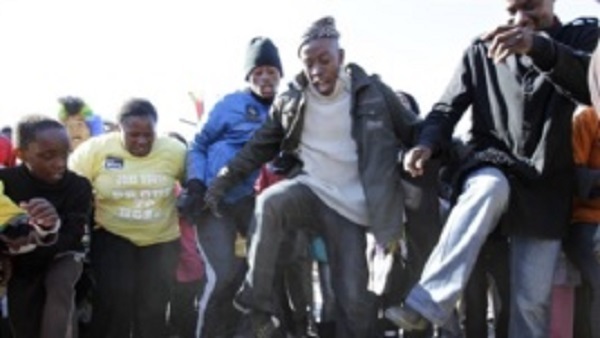 ZIMBABWE – A group of Zimbabwean youth has taken to dancing to shake off the frustration brought by lack of opportunities, in the face of a deteriorating economy and increasing difficulties to survive. Calling themselves the Elysium Dance Group, the 20 members of the dance troupe can be found daily at the Harare Gardens, kicking up their feet and moving in unison to hip hop and other locally-influenced beats. Wearing their baggy T-shirts and exuding urban street style, one would think these are a group of happy-go-lucky youngsters, just living out their lives. But to the contrary, for many it’s a way to destress and deal with broken dreams. One of the dancers, 23-year-old Marlon Magondo, said the dance group changed his life. General Hillary is the affectionate name the group has coined for Hillary Tandi Chin’ono, the dance group’s hard-driving leader. Chin’ono, who they also address “chief commander,” said for the youth, dancing is an outlet. With millions of youth in the country unemployed and out of options for making a living, many find themselves living in despair. The depressed economy has spawned what economists in Zimbabwe have called “a lost generation.” Chin’ono said the dancing helps give the young men and women of Elysium not only a temporary escape from the harsh reality of life, but also stops them from throwing their lives away to drugs or crime. Heather Gupo, 21, who joined Elysium four months ago after losing her job with a fast-food chain, said dancing offers her an outlet for her ambitions, despite her family’s disapproval. “I faced a lot of resistance including being beaten up, and locked indoors (by relatives) to try to stop me going to rehearsals,” Gupo told AFP. “I have been called all sorts of names, the mildest one being ‘bar dancer’. Gupo lives with her mother and four siblings, and when money ran short she was forced to give up hopes of studying law at university to take a job as a waitress. Now she helps with decorations at weddings, and works as a make-up artist. Daves Guzha, Zimbabwe’s most famous theatre director, likened the emergence of new dance groups to how the hip-hop movement grew as a mode of expression for disillusioned black youth in the United States. “Like hip-hop, it’s about the kids,” Guzha said. “In an environment like we have at the moment where there are no jobs, we are bound to see more of the dance groups trying to get more professional. One regular date for Elysium is the annual street carnival organized by the tourism ministry to try to lure tourists to Zimbabwe. Competition between rival dance groups is fierce, and standards are high. “You find a lot of young people, whether they have passed exams or not, are unemployed,” said Plot Mhako, head of the country’s biggest contemporary dance even, the Jibilika Dance Festival. The troupe earn occasional fees performing at corporate parties or civil events, but not enough to provide the dancers with a regular income.